Aaron Ramsey and Lucas Torreira, through their first-half goals against Napoli, have put Arsenal in pole position to qualify past the quarter-final stage of the Europa League. Unai Emery had several top players at his disposal as he welcomed Laurent Koscielny and Pierre-Emerick Aubameyang back into the starting lineup after injury and illness challenges respectively. Our second scorer for the night also joined the rest of his teammates upon his return from a three-match suspension. As expected of a typical Arsenal side, we took control of the game right from the beginning, giving the visitors something to worry about. 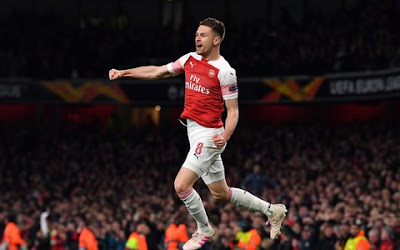 Ramsey 's shot got denied as well as a follow-up strike from Ainsley Maitland-Niles but the breakthrough was just minutes away. Outstanding ball distribution among Mesut Ozil, Ramsey, Alexandre Lacazette and Maitland-Niles yielded fruit as the Juventus-bound midfielder slotted a right-footed shot into the bottom corner. Our lead got doubled in the 25th minute when Torreira attempted one that deflected off Kalidou Koulibaly to go past Alex Meret. 2-0 it was at the end of the opening half even though other chances including one from Ramsey and a double from Aubameyang showed up. Napoli employed a new approach in the second half. They were sharper probably as a result of a motivational talk at the break. Their prayer for away goals seemed to have been answered shortly after, however, Insigne's goal was rightly adjudged offside. Arsenal needed to sit up at this point and they did. Much thanks to Koscielny and Torreira for making timely interventions at periods when we were at risk of being exploited. It was indeed the right time for their returns. What would we have done without them keeping Carlo Ancelotti's men at bay? Petr Cech did well to tip over Koulibaly's header before Meret was called to action severally, courtesy Ramsey, Maitland-Niles and Monreal. The final whistle was sounded at the end of four additional minutes meaning Arsenal head to Italy with a two-goal advantage. All we need to do at Naples next Thursday is to get at least a draw even if the scoreline will be 57-57 (smiles), but another win would not be a bad idea. In between now and our next appearance in the European competition is a trip to Vicarage Road on Monday night. There we will play Watford as part of tests we have to pass to secure a top-four finish. We need to resume Champions League football next season.